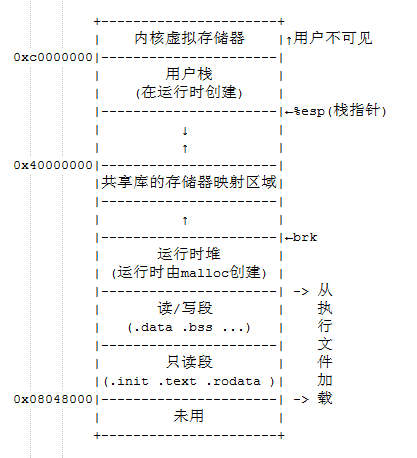 上篇译文的附件运行总是会segfault. 调试了很久之后,我发现bug在Tracer.c的第39行data.eip = (long) begin; 应该将它修改为data.eip = (long) begin+2; ,这里作者希望eip指向shellcode的首地址,然而,这是错误的.因为如果ptrace中断了一个系统调用,那么在PTRACER_DETACH时,内核会自动将eip-2,以此重新产生系统调用.修改过的代码理论上已经没有问题了,然而如果让它ptrace另外一个进程,仍然会杯具的segfault.可是,很奇怪的,如果用修改过的程序ptrace它的子进程(子进程与上面提到的被跟踪进程代码一样),就不会segfault了,输出是Oh,caught. (这是放在char *mesg的那一堆16进制数的输出结果,个人觉得,mesg里面的数据其实是一个输出字符串”Oh,caught”的汇编程序的二进制码,它是由objdump对这个汇编程序编译而成的二进制可执行文件做objdump -d输出得到的,而且,这里的汇编代码应该用到了由forward保存字符串,然后forward和backward之间jmp的trick,以此拿到字符串”Oh,caught”的地址.再次强调,个人推测,勿跨省)..ptrace一个原生进程会segfault,而ptrace子进程就可以运行得很好,这很诡异,对此我没有什么头绪. 这是本系列的第2篇How debuggers work: Part 2 – Breakpoints,在读这篇文章之前,请先确定你读过了part 1. CPU是线性执行每条机器指令的.对于非同步事件(asynchronous events),比如说IO和硬件计时器,CPU需要中断的协助.硬件中断往往是一个发往特殊”响应装置”(special “response circuitry”)的专用电子信号.响应装置捕捉到中断,使CPU暂停并保存它的状态,然后跳转到预定义中断处理程序(handler routine for the interrupt)地址,当中断处理程序结束时,CPU从它被中断的地方恢复运行. 软件中断理论上和硬件中断类似,但是在实现上,还是有所不同的.CPU支持使进程中断的特殊指令,当这类特殊指令被执行时,CPU把它看成是一个中断.这些中断(或称陷阱traps)造就了现代操作系统的很多神话(任务调度task scheduling, 虚拟内存virtual memory, 内存保护memory protection, 调试debugging). 某些编程错误(比如说除以0) — 通常叫做异常(exception),也被CPU当做是中断,在这种情况下,因为我们很难说,到底异常是硬件中断呢,还是软件中断 — 它们的界限变得模糊了.好吧,我已经离题千里了,让我们回到断点. 有了前面的知识作为背景,我终于可以对断点做出说明了,它是由CPU执行一个特殊的指令(int 3)实现的.所谓int,行话是x86上中断指令,意即对预定义中断处理程序的调用.x86用一个8位的运算数来标识中断号,所以理论上一共有256条中断指令.前面的32条指令由CPU专用,其中,3号中断指令 — 调试器中断(trap to debugger)是我们需要的. The INT 3 instruction generates a special one byte opcode (CC) that is intended for calling the debug exception handler. (This one byte form is valuable because it can be used to replace the first byte of any instruction with a breakpoint, including other one byte instructions, without over-writing other code). 理论我们已经谈得太多了,但是,它们到底意味着什么呢?我们如何使用int 3实现断点呢?Talk is cheap,show me the codes! 额,在这里我又要偏题了.如果你对为什么地址会是0×8048096,这个地址又意味着什么实在感兴趣的话,可以读读下面的Digression – process addresses and entry point.不然的话,直接跳过. 老实说,0×8048096代表的东西很少,它离二进制文件的.text section不过几个字节罢了. (译注: 可以对着此图参考这里).仔细研究一下上面的dump输出,我们可以看到text段从地址0×08048080开始,这说明OS把ELF文件中的.text section映射到此地址开始的虚拟内存空间中.在Linux上,这个地址是独立的(也就是说,当可执行文件被装载到内存时,它不可重定位. )(译注: 自行google -fPIC),因为虚拟内存机制使得每个进程看到的是整个32位空间(故称线性地址). 但是,为什么一定得是0×8048080呢?好吧,这就是所谓的历史遗留问题.每个进程空间的前128M是被栈私用的.128MB = 128 * 1024 KB = 128 * 1024 * 1024B = 2^27B,正好就是0×8000000,可执行文件的其他section可能就从这里开始被映射.特别的,0×8048080是Linux下ld链接器的入口地址,它可以通过传给ld的参数-Ttext修改. This one byte form is valuable because it can be used to replace the first byte of any instruction with a breakpoint, including other one byte instructions, without over-writing other code. x86上的int指令占据两个字节 –- “0xcd 中断号”.如果你讲int 3指令直接code成cd 03,那就上当啦,哈哈.因为在x86的实现上,int 3对应的是单字节指令0xcc. 如果我们想要在dec eax对应的地址插入断点.dec eax的机器码正好是一个字节的(0x48),如果插入的断点机器码超出了一个字节,那么dec eax的下一指令(call)将不可避免的被篡改, 这会让程序产生不可预料的错误. * debuglib.h and debuglib.c – 封装了跟踪进程的一些功能. 自然的,这里的圣经是 Intel’s Architecture software developer’s manual, volume 2A. 不会吧,还来啊? 那是! Linux使用int 0x80来实现系统调用,以此让进程从用户态进入内核态.用户把中断号和参数写入寄存器,然后执行int 0x80.这时,CPU跳到对应的中断处理程序 — 它查看寄存器,然后决定应该使用哪个系统调用. ELF (Executable and Linkable Format) 是Linux上object files, shared libraries 和 executables的通用格式.